Doug Cooper Spencer was born on this day in 1954. He is a highly respected novelist, short fiction writer, essayist, lecturer and LGBTQ activist living in Cincinnati, Ohio. Doug Cooper Spencer was born in Lincoln Heights Ohio, an all-black town north of Cincinnati to Ellis Cooper, who was a laborer and his mother Estella Cooper, was a homemaker. He is the fifth child of eight children, and attended Lincoln Heights Elementary and High School, before graduating from Princeton High School in 1972. Following High School, Doug enrolled at Thomas More College, where he majored in English Literature and minored in Theater Arts, but left after two years because he wanted to travel the world and write. He then took on various jobs including one where he assisted as a staff member for the TV production company that produced “The Phil Donahue” show which would become the prototype of all talk-shows to follow. Not satisfied with the fact that he wasn’t traveling the world, Doug joined the Navy where he traveled extensively and began to write. It was while he was serving in the military that he met so many other same-gender-loving (SGL) men and women from various U.S. military branches and Doug began to speak openly about the rights of same-gender-loving/trans (SGL/T) people, and as a result, he was kicked out of the military. Doug came out in 1972, and he talks and writes of growing up black and gay in the 1950s and 1960s, and in particular, of growing up in the unique environment of an all-black city. Lincoln Heights, Ohio, was an incorporated city where everyone was black, and the city government, businesses and school system were run by African Americans. He credits the pride that was instilled in him from seeing black people working against the odds to accomplish things as the same pride he eventually used to pursue his life as an authentic SGL man. A few other notables who lived in Lincoln Heights at the time Doug was growing up there are, poet Nikki Giovanni, and The Isley Brothers (who lived across the street from Doug), and a young, then unknown guitarist, named Jimi Hendrix who would stay with the Isley family in between tours as the guitarist for the band. Memories of that period of his life are found in Doug’s novels, in short stories and memoir entries at his website, Dougcooperspencer.com. He intends to put the short stories and memory pieces in book form in the near future. Growing up same-gender loving was pretty easy for Doug. He says though his family had an idea that he was homosexual, most people really didn’t have a real world understanding of what that meant, Doug says, including himself. It was something that was “understood to exist” but not discussed or clearly comprehended. But love would triumph over differences in his close-knit family, and his coming-out was even accepted by those he knew in the community. Like many Black families, Doug Cooper Spencer was raised in the church, but appreciates that his parents were wise enough to know how far to go in accepting church indoctrination. In the town of Lincoln Heights he says he can recall “developed, authentic older SGL men and women“, but that they were largely accepted as part of the community. He recalls that he and others like him were simply living their lives as responsible community members in an all-black town. But the larger, mostly white community was more troubling, more discriminatory, and “energized by white and Judeo-Christian ethics – not the black homophobia that the media tries to present” that set him on the journey to becoming a self-loving, SGL man and to prove the world wrong. Doug Cooper Spencer currently lectures at The University of Cincinnati in the areas of race, SGL/T culture and development, and creative writing. Doug also serves on The University of Cincinnati’s LGBTQA faculty and staff advisory board. His four plus decades as an advocate for SGL/T rights and racial equality has enriched his life and given him a treasure of history and wisdom that he often uses in his lectures and writing. From the early to mid 1990s, Doug served as the Director of Liaison for The Cincinnati Chapter of “Brother II Brother”, an advocacy group for the prevention of HIV and for the promotion of human dignity for African American SGLT people in the Greater Cincinnati area. Working with both the Center for Africana Studies at The University of Cincinnati and the university’s LGBTQA center, Doug Cooper Spencer helped to develop and initiate the first Celebration of Black LGBTQ History during Black History Month, an event that has continued with much success. Doug is the author of three novels: “This Place of Men”, “People Like Us” and “Leaving Gomorrah” which are books of the “This Place of Men Trilogy”, as well as a book written as an epistle “A Letter to a Friend: Thoughts on Living As A Gay Man”. He has also written numerous essays, short stories and autobiographical memoirs which he calls ‘memory pieces’. Doug Cooper Spencer’s writings have appeared in the anthology “Mighty Real: An Anthology of Same Gender Loving Writing”. He also wrote the forward to “Carry the Word” which is a reference book of black SGLT writers. Much of Doug Cooper Spencer’s writings can be found at his website, Dougcooperspencer.com where he also hosts a blog, “The View from Here”, and a growing list of black SGLT historical profiles at the “Celebrating Black Gay (SGLT) History” section at his site. In 2006 Doug was nominated by “Clik Magazine” as one of their “Elite 25 Black Gay Writers”. Doug Cooper Spencer has served as in-house lecturer at the Cincinnati branch of The National Urban League’s “Leadership Training Forum”, from 1989 to 1996, and he also aided in the production of, and appears in the award winning 1996 documentary “All God’s Children”, a film that looks at the role of black gays and the black church. Doug co-produced “The Eyes Open Festival” and was president of “The Eyes Open Festival Organization”, a non-profit organization that used the arts in the black SGL/T community to educate and inspire all communities to wellness. When he’s not working, Doug, who describes himself as a true introvert, says he enjoys taking long walks alone in the city, reading, listening to NPR, and watching movies with his husband. They also enjoy going to museums and art galleries, traveling, watching football and field and track events together or simply relaxing quietly at home and having a good laugh. Doug Cooper Spencer has enjoyed the love and support of his husband of fifteen years, hair stylist, barber and photographer, Gregory Cooper Spencer whom he met in 1998. In 2011, journalist Darian Aaron interviewed Gregory and Doug Cooper Spencer for his book “When Love Takes Over: A Celebration of SGL Couples of Color”. Doug is the proud father of Courtney Nicole Cooper who graduated from The University of Cincinnati with a degree in Comparative Literature and who works in Education and as a freelance editor. Currently Doug is at work on a fourth novel, as well as a collection of short stories and memory pieces, in addition to a screenplay. I asked Doug what lasting legacy does he hope to leave behind and his answer was simply, “a better world.” Today, we join with Doug Cooper Spencer in celebrating his fifty-ninth Birthday, and thank him for making our world better, and for his many contributions to our pride and community. 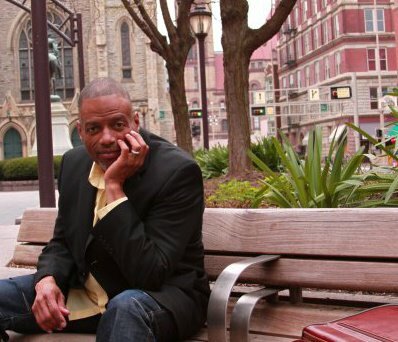 Stephen Maglott is a SGL/Black Historian and Writer.